At the beginning of the Muromachi (室町) era around the Oei (応永) era (1394) most of the different schools in the Bizen (備前) province were virtually absorbed by the Osafune (長船) School. The Osafune (長船) School had long been the main school in Bizen (備前) province. The various schools gradually lost any distinctive characteristic features they may have had, and began to display the characteristic features of Bizen (備前) workmanship of this period. Oei-Bizen (応永 備前) is the general term for the Osafune smiths who worked in the Oei (応永) era (1394-1428). The most famous smiths of this period were Yasumitsu (康光), Morimitsu (盛光), and Moromitsu (師光). They were collectively known as the Oei no San Mitsu (応永の三光) (three mitsu of the Oei era). The blade shown above is a tantô by the Shodai Yasumitsu. It is dated as having been made in 1424, the thirty-first year of Oei. SUGATA: There are tachi, katana, and wakizashi of both shinogi–zukuri and hira-zukuri form. Tanto of less than 30 cm are rare. These smiths tried to copy the tachi shape of the Kamakura era but these blades are different in that they have a shallow saki-sori rather than a sweeping koshi- zori. Generally, the nagasa of tachi will be about 70 cm and wakizashi will be about 50 cm. This is the period that marked the beginning of the production of katana and wakizashi. Wakizashi generally have narrow mihaba, small kissaki, and saki-zori. JIHADA: The jigane is soft and the jihada is mokume-hada mixed with o-hada. Clear bo-utsuri appears. Even when the hamon is midare-ba, the utsuri tends to be bo-utsuri. On occasion, midare-utsuri can be found also. HAMON: It will be nioi-deki and tends to be koshi-no-hiraita midare mixed with choji midare. The thick nioi line is very soft. Also, one finds suguha mixed with ko-midare or straight suguha. HORIMONO: Bo-hi with soe-bi or tsure-bi are quite common. The top of the hi is located just above the yokote. The bottom of the hi is finished around the machi. Horimono is often found on wakizashi with the design on both sides being the same. Ken-maki-ryu or the names of gods and deities are engraved on the omote and ken with dokko, tsume or bonji on the ura. Bo-hi with Soe-bi or tsure-bi whose bottoms are maru-dome are usually engraved above the horimono. NAKAGO: Shorter and less tapered nakago with kurijiri are found. Cho-mei (long signature) including the date is common. We find katana-mei becoming common since this period marks the beginning of the production of katana. Generally speaking, smiths who came later in the Muromachi (室町) era were said to belong to the Sue Bizen (末備前) School. These smiths worked throughout the later part of the Muromachi (室町) era and into the Sengoku Jidai (戰国時代)(1490-1600). There were smiths, however, who were active between the years of 1429 and 1465 that can not readily be classed into either the Oei-Bizen (応永 備前) or Sue-Bizen (末備前) schools. Since their work shows qualities slightly different from either of these schools, they are referred to as the Eikyo-Bizen (永享備前) smiths. The blade shown here is by the smith, Norimitsu and it is a representative example of the Eikyo-Bizen (永享備前) School. It is dated as being made in 1465, the sixth year of Kansho (寛正) at the end of the middle Muromachi Era. SUGATA: The nagasa is short, the blade is slender, and the kasane is relatively thick. The blade is compact and can be used with one hand. This is where the uchigatana made its first appearance. JIHADA: The mokume hada is dense in comparison with the Oei-Bizen blades. Midare utsuri or bo–utsuri is found. HAMON: Wide koshi–no–hirata midare mixed with choji midare is found. A uniform pattern is not regularly repeated, unlike Sue-Bizen. Ha–hada is visible and there are few hataraki. HORIMONO: Bo-hi, futatsuji-hi, bonji, and elaborate ken-maki are all found. They were skillful carvers. MEI: Most mei will have “Bishu” rather than “Bizen”. Also “Osafune” and the name of the smith will complete the mei. The Bunmei era marked what we commonly call the late Muromachi period or the Sue Muromachi period, hence the Sue-Bizen period. Technically the Muromachi era ended in 1573 when Oda Nobunaga drove the last of the Ashikaga Shoguns, Ashikaga Yoshiaki, out of Kyoto. In the sword world, however, we consider the end of the Muromachi era to be 1596 when the Keicho era signaled the beginning of the Shinto sword period. For the purposes of this paper, we will consider 1596 to be the end of the Sue-Bizen (末備前) school of the Koto sword period. It should be noted that in the ninth year of Tenshô (1591), there was a great flooding of the Yoshii River in Bizen (備前) Province. This flood ended the golden age of sword making in Bizen (備前). The sword trade had prospered here through centuries of warfare and civil disturbances and in one brief period was swept away forever. While sword making did continue in Bizen (備前) throughout the Shinto and Shinshinto Eras, it never again reached its prior height in quality or quantity of swords produced. The later Muromachi (室町) period was commonly known as the Sengoku Jidai (戰国時代) which translates as the age of the country at war. It was called this because it was a period in Japanese history that was unprecedented in the amount and intensity of warfare between the feudal lords, Daimyo, as they struggled for supremacy. A by-product of this constant warfare was a demand for swords and other weapons that was unrivaled either before or after this period of conflict. One of the most prolific schools in the Muromachi period was the Bizen (備前) school. Unfortunately, there were relatively few good smiths working in Bizen (備前) province at this time. Because of the great demand for weapons, most of the Sue-Bizen (末備前) smiths produced numerous kazu–uchi mono pieces (mass produced blades). These were basically factory-produced blades that were made without giving any regard to the quality of the pieces. These blades were made after the Eisho era (1504). 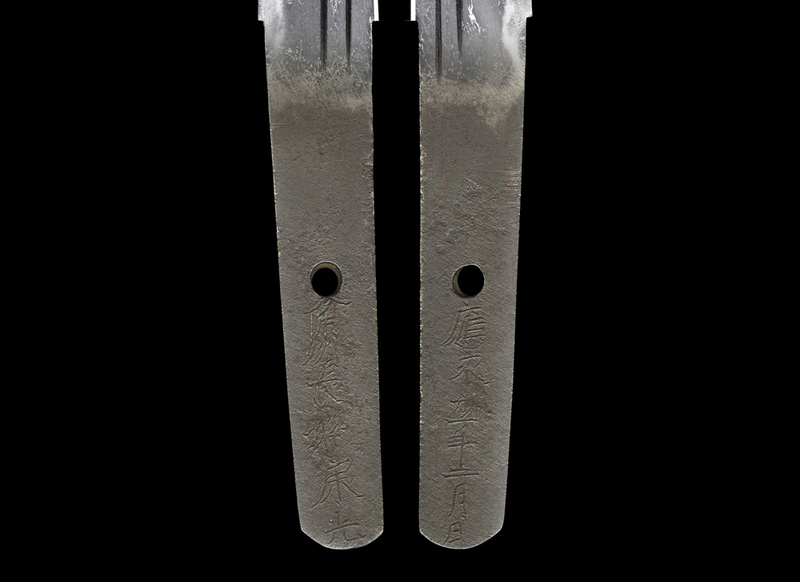 For the most part, these blades were signed with only a two-character signature such as Sukesada (祐定), or they were signed Bishû Ju Osafune (備州住長船) (and the smith’s name). SUGATA: The nagasa is generally from 65 to 70 cm, and the sugata resembles Oei-Bizen but it is a little slenderer in the monouchi area. JIHADA: Shingane often appears on the surface because of the attempt to economize on valuable materials (tamahagane) and of the use of more shingane in the core. Rough masame-hada and tsukare utsuri (tired jihada or a jihada worn down from repeated polishing) will also be common. When the shingane comes out into the hamon, the pattern of the hamon will be obscured. HAMON: There are many yaki-kuzure, and the size of the various midare is not at all regular. BÔSHI: Generally, they will have a yaki-kuzure that will be different on each side of the blade. NAKAGO: Kazu-uchi mono usually have a two-character signature or they are signed simply Bishû Ju Osafune (備州住長船) and the smith’s name. Occasionally they will be found signed Bizen Kuni Osafune… (備前国長船…) but never Bizen (no) Kuni Ju Osafune…(備前国住長船…). During the Sue-Bizen (末備前) era, quality swords were also produced, the workmanship of which is clearly distinct from that of the kazu-uchi mono. Leading smiths were Katsumitsu (勝光), Munemitsu (宗光), Tadamitsu (忠光), Yoshimitsu (賀光), Sukesada (祐定), Yukimitsu (幸光) and Harumitsu (春光). Some of these names were used by several generations of smiths with Sukesada (祐定), being the most common. Often, on better, custom ordered blades made by these smiths, a smith’s given name such as Uemon no Jo (右衛門尉) was used in his signature. Generally, the signature of quality made blades will start with the characters, “Bizen (no) Kuni Ju Osafune……(備前国住長船…). The blade shown here is by the smith, Katsumitsu. It is dated as being made in 1513, the ninth year of Eisho (永正) ,the middle of the late Muromachi Era. Please note that despite the form of the signature, this blade was made before the start of the production of kazu-uchi mono described above. SUGATA: Uchigatana were the main swords produced in this period, followed by the hira-zukuri wakizashi, tanto of either hira-zukuri or moroha-zukuri shape, and naginata. Uchigatana generally have a length of 63-66 cm, deepsaki-zori, wide mihaba, thick kasane, full hiraniku, relatively small kissaki, and stout sugata. The nakago is short, to allow for single-handed use. Just before the start of the Shinto era, swords became longer ranging from 72 to 75 cm. Around this time, the saki–zori is relatively shallow. The nakago became longer for two hand use. Tantô were usually made in one of two types. The longer shape was around 30 cm and the other was short being under 20 cm in length and resembles an older Kamakura tantô. The nakago is long in proportion to the length of the blade. Yoroi-doshi with a thick kasane and exaggerated uchizori will be found. Also, a relatively new shape of tantô came into vogue, the moroha-zukuri tantô. This shape can be found not only in the tantô of the Bizen smiths but also in other schools such as the Sue –Mihara, Sue-Seki, Sue-Yamato, and Sue-Soshu schools. JIHADA: Fine ko-mokume hada with jinie is found and the utsuri is neither clear or distinct but will often be present. Often the ji-nie will be found in the form of chikei through-out the jihada. HAMON: Usually we find a wide hamon of nioi deki but sometimes they were inclined toward nie deki. One of the most common hamon is koshi-no-hirata midare which is based on a wavy pattern and which is consistent in its width from bottom to top. Each top of the midare has a peculiar shape which is called “kane-no-hasami” (crab’s claw). O-midare, nie-kuzure, and hitatsura are also seen. Nioi–kuzure is seen on most Sue-Bizen swords. In the case of a moro ha-zukuri tanto which is midareba, the kaeri is in proportion to the hamon or becomes suguha and extends right down to the bottom. BÔSHI: Ko-maru sagari (descending) when the hamon is suguba. When the bôshi is midare-ba, it is in proportion to the hamon, but the patterns on each side can be different. The kaeri does not form a proper pattern, and it looks like hitatsura in the monouchi area extending down from the ko-shinogi about 6-9cm. NAKAGO: Short (except for tantô as noted) and relatively less tapered nakago are found. Chô–mei (long signature) is standard in the case of custom -made works. Also, included on the nakago are dates, second names (given names), and sometimes the owner’s name. Unfortunately, as has been mentioned, the demand was so great that quality sword smiths’ using tested quality methods could not keep up with the increased demand. Further, the times were such that it became possible for swords produced by unskilled smiths to sell in great numbers. Such swords are called kazuuchi-mono (mass produced swords). These are swords that are generally carelessly produced and of inferior quality. Tens of thousands of such swords were exported to the Ming Dynasty of China during this period. This does not mean that all Bizen swords produced during this period were kazuuchi-mono. Far from it, there were some truly great sword smiths who lived during the Muromachi era. The most recognizable name of this period is Sukesada (祐定). While more than eighty smiths using this name have been recognized, there are a handful of them who are acknowledged as making top quality swords. In particular Yosazaemonnojô’s (与三左衛門尉) name is highly famed. In addition, Genbeinojô (源兵衛尉), Hikobeinojô (彦兵衛尉), and Tôshirô (藤四郎) are the first names of prominent Sukesada (祐定) smiths. Other smiths of this period include Munemitsu (宗光), Katsumitsu (勝光), and Tadamitsu (忠光), all of who produced a large number of superb works. The Kiyomitsu (清光) name is also famed, particularly that of Gorôzaemonnojô Kiyomitsu (五郎左衛門尉 清光). The katana were about two shaku, one or two sun. From around the Tenshô era and later, the lengths increased. The wakizashi are hon-zukuri as well as hira-zukuri, however the majority are hon-zukuri. As for tantô, many are what are called a yoroidoshi, i.e. small, without curvature, and very thick thus having the strength to pierce armor. Also a great number of moroha zukuri tantô can be found during this time. They also had a propensity to use a lot of horimono on their blades. Their kitae is mokume mixed with itame that is somewhat course. However, there are works that have a very tight ko-itame hada. Many have bô-utsuri, however, the majority have an indistinct ji-utsuri. Many of the hamon are suguha, however, there is a mixing in of gunome-choji-midare which is called “kani-no-tsume” (crab claw). There are many works that have a very tight nioi-guchi. The bôshi are ko-maru or o-maru as well as midare-komi. All are deeply tempered with kaeri that extend down the mune of the blade for a distance. The nakago in comparison to the blade lengths is largely stubby and short. As the length of the blades tended to increase during and after the Tenshô era, so did the length of the nakago. As for tantô, they are exactly the opposite of the longer swords, with the nakago being extremely long and unbalanced compared to the short length of the blades. Among the blades of the Sue-koto period, there are a large number having inscriptions of the person ordering the blade. Additionally these carefully crafted blades are signed differently than are the mass produced blades. They are signed by the smith using the kanji, “Bizen no Kuni Jyû” (備前國住) followed by his given name such as Yosazaemonnojô (与三左衛門尉). On the other hand, the majority of the blades we find from this period are the poorer quality mass-produced kazuuchi-mono. 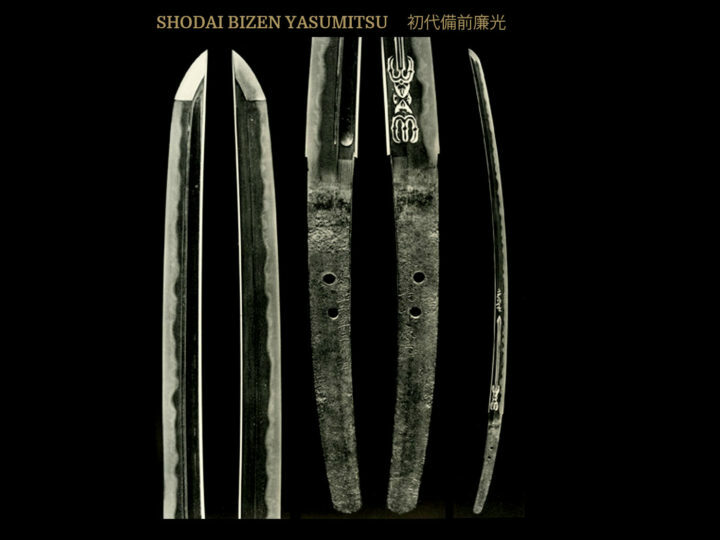 These blades are signed “Bishû Osafune” (備州長船) followed by the smith’s family name, i.e. Sukesada (祐定). Often they are signed with only the two character signature Sukesada (祐定). This is an important way to distinguish the custom made blades from the mass produced blades. This would be a good time to spend a few minutes on the characteristics of the kazuuchi-mono. As noted, they were mass-produced during this time of great need. Generally they were made by less skilled smiths who used less steel in an attempt to economize on tamahagane. This, of course, led to more flaws and the common appearance of shingane. SUGATA: The nagasa is generally from 65 to 70 cm, and the sugata resembles Ôei-Bizen but is a little more slender in the upper part. JIHADA: Shingane often appears on the surface as a result of the attempt to economize on valuable materials (tamahagane) and of the use of more shingane in the core. Rough masame-hada and tsukare utsuri (tired jihada or a jihada worn down from repeated polishing) also appear. When the shingane comes out into the hamon, the pattern of the hamon becomes obscured. HAMON: There are many yaki-kuzure, and the pattern of the various midare is not at all regular. At a glance, the yaki-kuzure look likes the claws of a crab (kani-no-tsume). BÔSHI: Generally has yaki-kuzure and is different on each side of the blade. NAKAGO: Kazuuchi-mono usually has the same style of signature, i.e. Bishû Osafune (備州長船) or Bizen no Kuni Osafune (備前國長船) followed by the smith’s name, but without any zokumyo (given name). In Tenshô 18 (1590), there was a great flooding of the Yoshii River inundating the city of Osafune, destroying the access to the necessary raw materials, and killing most of the sword smiths. The trade of the sword smith had prospered in Bizen through centuries of both relative peace and warfare and, yet, in one brief period it was swept away by natural forces. Within ten years of this event, the period of constant warfare ended when Tokugawa Ieyasu won the battle of Sekigahara and brought the stable peace of Tokugawa rule to Japan lasting more than 250 years. While the Bizen province continued to produce sword smiths and swords, it never again reached its former position of prominence.